The Cody Country Chamber of Commerce is a non-profit, voluntary membership organization of business and professional people and individuals who work together to build and sustain a better community in which to live and in which to conduct business by pursuing specific goals identified by the membership, board of directors and staff. Investing membership dues allows the Chamber of Commerce to work for our community. Did you know…? Each year thousands of relocation requests are filled by the Chamber for businesses and families interested in moving to Cody Country. Workshops and educational seminars that help businesses grow and prosper are provided by the Chamber every year. Chamber staff maintains a complete and comprehensive online calendar of events and activities. The service is free of charge to the Cody community, and is a great way to get the word out about an activity or fundraiser. Visitor Center staff assist over 85,000 visitors each year and provide information on Cody Country businesses, services, and area attractions. Each year thousands of travel guides are mailed from the Chamber to visitors planning vacations to Cody/Yellowstone Country. Cody Bucks are a great gift idea. This Chamber program keeps Cody dollars in Cody. Cody Bucks can be purchased at the Cody Country Chamber of Commerce office, they come in denominations of $10, $20, or $50. They are good at any local business, shop local! The Cody Country Chamber of Commerce web site is visited over 150,000 times each year by people planning vacations, and businesses and individuals interested in relocation. Working with community partners including the Cody Events Committee, the City of Cody, Park County, civic organizations, local businesses, and others the Chamber helps to build community strength and unity. Chamber of Commerce volunteers and staff donate hundreds of man-power hours each year to community events. If you are interested in becoming a Cody Country Chamber of Commerce Member, CLICK HERE TO LEARN MORE! We've partnered with Wyoming Chambers Health Benefit Plan/Covenant Insurance Group Services. 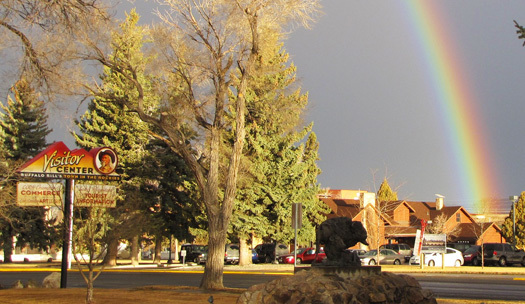 The Wyoming Chambers Health Benefit Plan was founded in 2007. Beginning with two participating chambers (Sheridan County and Campbell County), the plan initially included 28 employers and 184 enrolled employees and their families. Currently, the plan covers 11 chambers in Wyoming, 52 employers, and 355 employees. The Health Benefit Plan offers employees a choice among seven different medical and two dental benefit choices. All of the options are being used, with almost half of the employees having selected medical option 2 - $1,000/year deductible and $1,800/year out-of-pocket limit (including the deductible) per individual. The plan is self-insured, paying its own claims up to a stop-loss limit beyond which "excess insurance" comes into play. At the end of 2012, the plan had accumulated $1,201,273 in reserves (or an average of $3,384 per covered employee) - the cushion available to cover claim fluctuations as premium revenue and claim payments occur throughout the year. Contact the Chamber for further information, and we will put you in touch with Covenant Insurance Group Services for enrollment. You will gain access to a variety of FREE webinars and workshops through the Member Information Center. Topics will vary from administration to customer service to management and marketing.